The Boyz are a notorious trio of lowlife hired muscle willing to do any dirty job so long as they get something out of it. They’ve notably been employed by the likes of Max Indeks, Enchantress, Madame Mynx, Dee Lisha, Clawdette, and Trixtress, despite their general ineptitude and frequent defeats by the Superheroine Squad. 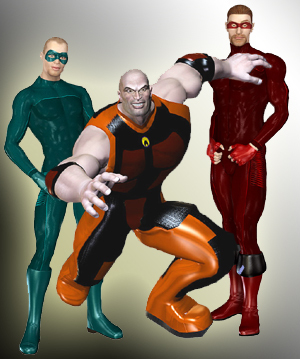 Originally, the trio had formed as professional wrestlers in the Metrobay Extreme Wrestling Federation, but they were disqualified and banned from competition once it was revealed that Bronk had used illegal performance enhancers, Fingers and Dipstick being accessories to the scandal. They then were paid handsomely by Max Indeks to be guinea pigs for APEX Labs, bolstering their physical capabilities and turning them into low-profile supervillains.